CAPE TOWN. 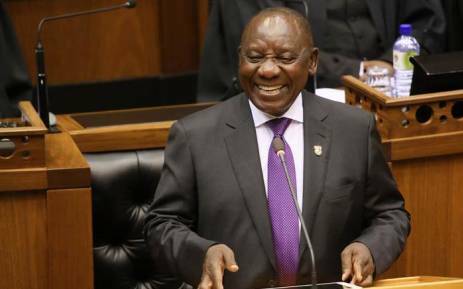 – President Cyril Ramaphosa has reined in opposition demands of a prospective Cabinet reshuffle, saying an announcement on a new Cabinet will be made by him “at the appropriate time”. President Ramaphosa took to the podium in the National Assembly yesterday to address both Houses of Parliament during his State of the Nation Address (SONA) reply. This after parties debated his SONA on Monday for a marathon 10 hours. When the time came to address one of the most common themes in the debate – the composition of a new Cabinet – Ramaphosa was quite critical of opposition parties in their “attacks” on ministers. “Whatever views one might hold about members of Cabinet, this does not justify in any way the kind of character assassination and insults we have heard,” he told the House. African National Congress MPs applauded him as he spoke. Social Development Minister Bathabile Dlamini looked up from her desk and listened intently. Opposition parties have made a strong call for President Ramaphosa to reshuffle his Cabinet and axe some ministers, especially those who have been linked to the controversial Gupta family. The House then fell silent in anticipation. “On the matter of the composition of Cabinet, an announcement will be made by the president at the appropriate time,” he said. Groans then came from the opposition benches, which were soon replaced by the same sense of anticipation. So, don’t get ahead of yourselves, he said off speech. “It will be addressed and when it is addressed, it will be addressed very carefully without any noisy interventions that I am hearing on this left-hand side,” he said with a smile. “Lock them up!” shouted one male Democratic Alliance MP. As for President Ramaphosa’s promise to review the size and configuration of his Cabinet, he said that would be a much longer process. It will therefore take several months, he said, but will definitely include broad consultation, including with opposition parties. To this, the opposition benches applauded. President Ramaphosa also ended this section of his speech by indicating that lifestyle audits for public officials were on the horizon. Police Minister Fikile Mbalula had also indicated to him earlier that senior member of the South African Police Service had also volunteered to undergo the same procedures. “Lock them up!” the same DA MP shouted one more time.